Mahat Trying To Mend Things Up With Prachi! Will She Accept? Bigg Boss contestant Mahat who's in a serious relationship with his girlfriend Prachi, announced that he's in love with his fellow contestant Yashika. During the show, he said that he has feelings for both Yashika and Prachi and he's in a confused state. His girlfriend Prachi was so supportive of him previously, and was handling the haters like a boss! Even though he was seen flirting with Yashika on the show, she still took the social media to show her support to Mahat. But after Mahat confessed his feelings openly to Yashika, Prachi took the social media again. But this time to say that she has nothing to do with him anymore! 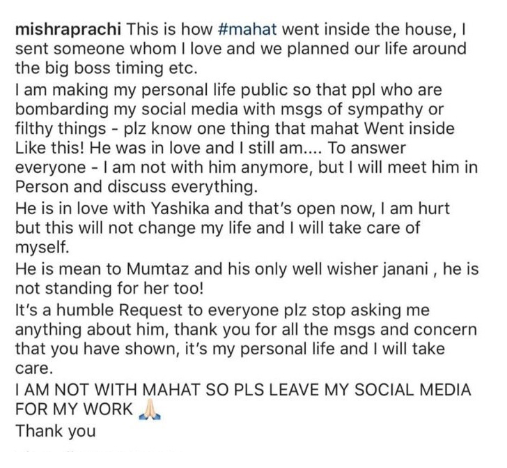 But after Mahat left the Bigg Boss house, he posted on Instagram that he loves Prachi more than anyone else in the world! Is he indirectly appologizing to Prachi by saying he loves her more? Will Prachi accept his appology? What's your take on this?